Excellent WiFi, but limited cell phone coverage and no cable. Would spend the entire summer there if possible. This is a GREAT destination park! The park is well maintained, the owners and staff are wonderful, and the views are spectacular! The park has THE BEST laundry and restroom facility we've ever seen! They're all in a single building that was always spotlessly clean. There's a game room in the same building, so you can shoot pool while waiting on your laundry. Open fires are not allowed at the campsites, but they have a community campfire every night, weather permitting. On Sundays they have an ice cream social! The park is 35 miles from the north entrance of Yellowstone National Park, which is a bit of a drive, but it's an easy drive and a treat for the eye. Not impressed with the location of the RV Park, when they said it was close to the highway and no one has complained, I find this hard to believe. We stayed here two nights and our site was #65 which was right beside the guard rail for the Highway to Yellowstone. The noise was unreal and we would have went to another RV Park but we would have not been re-imbursed. If you like the noise of traffic from 7:00 am - 10:00 pm this is the site for you. This may be the most beautiful RV park we have ever visited. We were in site 48 less than 100 feet from the Yellowstone River as it flowed by, with stunning views of the surrounding mountains. Gorgeous! The sites are completely level gravel with grass at each site and nice trees. A good amount of space between each RV so you don't feel too close and fairly deep pull-throughs. Very friendly staff and the park is kept spotless. The only negatives is the laundry which is kept very clean but only had 4 washers and 3 dryers. Too few for the number of RVers. It is also a little out of the way for Yellowstone NP, approx. 30 miles and 18 miles to the nearest city, Livingston. However we felt the beautify of this park out weights the driving distances. One additional bonus is the Camel Discovery Center which is located directly across the street from the RV park. We decided on our last day to visit and ride a Camel. To our surprise it was very interesting and the knowledge of our tour guide was excellent and lots of fun. We would definitely stay here again. Outstanding restrooms/showers - the view of the river is incredible. Everybody is extremely polite and friendly. Definitely a great place to stay, even with a little traffic noise, it was a wonderful stop. This has been our most favorite RV Park on our summer tour of the US. Located on the river and 30 miles north to the entrance of Yellowstone. 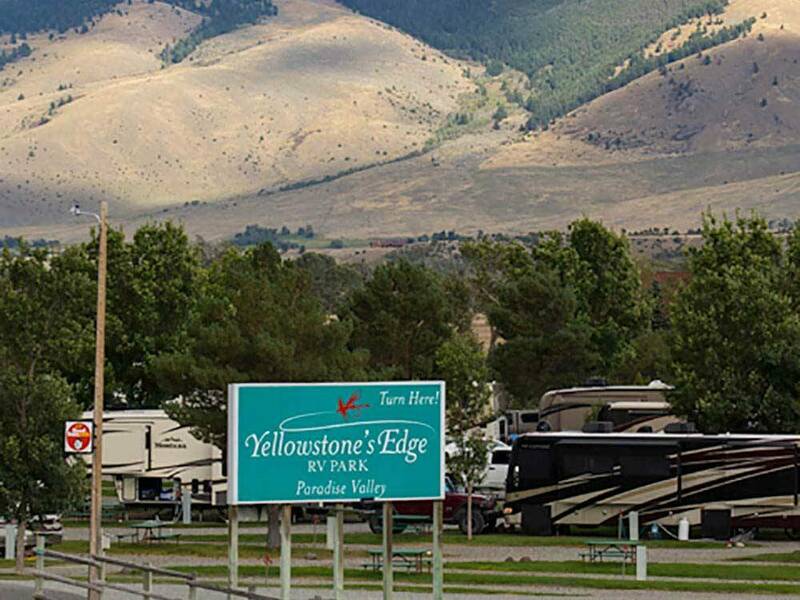 Beautiful and very well maintained RV park. The staff is equally as knowledgable and helpful in every way. While all sites could be a little larger, this is by far the nicest campground we have ever stayed in.